The Sonntag Fins SL-S is made for slalom and works over a large range (even very good for SPEED). 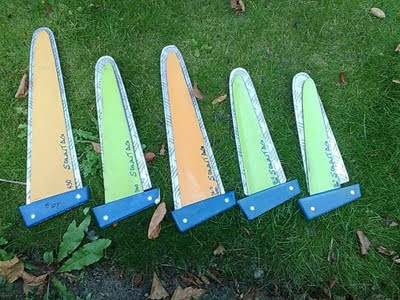 This is the first (and so far the only) fin into production, you can buy this fin (click on sonntag logo on speedsurfingblog homepage)!! The SL-S has a very flexy tip, this makes a sort of hydrofoil-lowdrag feeling. The fin has a shorter cord than other famous fins (like Select SL7), still the SL-S is not sensitive for spinout. Also the SL-S will be my weapon of choise when I finally do an attack on the hour-record... Gybing is so easy, the SL-S is really great in handling lowspeed and lowwind. It is still a very new fin/concept, sooo many thing to test, there will be a second review with all information!